It’s been a long time since I read SOMETHING BORROWED and SOMETHING BLUE, and WHERE WE BELONG reminded me why Ms. Giffin is one of my favourite authors. This was a wonderful, feel-good kind of read, and it’s been a while since I’ve read something of a similar tone. Like other women’s fiction heavyweights, Ms. Giffin’s prose is almost rhythmical, but she manages to tell a heartwarming story without making me bawl my face off (which is great as I’ve started wearing mascara again and it stings my poor eyeballs when it’s all runny). 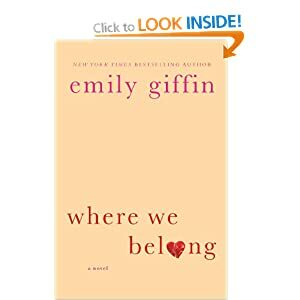 There are two great points of view in WHERE WE BELONG: Kirby, an eighteen-year-old soon-to-be-high-school-graduate who finds her birth mother and Marian, a thirty-six-year-old high-faluting TV producer who is also said birth mother. Here’s what makes this book awesome—it’s Kirby! She's super authentic with her high-school angst, but also extremely mature, while being very vulnerable despite her belief that nobody can notice. Plus, she plays the drums. And can sing. And has a steady moral compass. In short(ish), it was a fantastic POV and I was enthralled with Kirby’s interpretation of the emotionally-dense situations. I’ll admit that about a quarter of the way through, I didn’t know how the story would need another two hundred-odd pages to wrap everything up, but then the plot took an interesting twist. Not to a GONE GIRL degree (thank goodness, as my heart wouldn’t have been able to take it, haha) but the story I’d first interpreted as an orange slowly turned into a onion, and then the rest of WHERE WE BELONG examined the delicate layers of hurt that stem from making difficult decisions. As in life, nobody’s totally innocent (well, except for Kirby, obviously) but Ms. Giffin created flawed characters who, in the end, you don’t feel quite as comfortable judging by the time you turn the last page. And that kind of subtle redirection is exactly the reason that I’m a Giffin-fan. Or, Giffin-ite, if you will (I just made that up, that group doesn’t actually exist…but it should!). This is probably my favorite Emily Giffin book. Now I do love them all, both with so many there's such a struggle over who to root for because you can't quite get behind their decisions. But with this one, for the first time, I didn't feel like it was hard for me to root for any of the characters. And more than that, I could root for all the characters without feeling like I was choosing one over the other.